Maputo, Mozambique (PANA) - The governor of the southern Mozambican province of Inhambane has declared an emergency, following torrential rains over the past week which have isolated much of the province. This El Niño/La Niña Update is based on information obtained from the national Meteorological and Hydrological Services (NMHSs) of WMO Member States and affiliated organizations. Information contained herein is current as of 18 February 1999. Extracts may be freely used elsewhere provided acknowledgement of their source is made. Users are strongly advised to contact their NMHS for more detailed information. 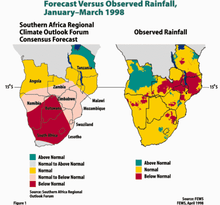 JOHANNESBURG, 23 February (IRIN) - Officials in Mozambique said a good harvest was expected this year even though some part of the country has been subjected to heavy torrential rain and flooding in recent weeks. MAPUTO -- The United Nations World Food Programme has approved a $2.7-million emergency operation to feed about 80,000 people in southern Mozambique over the next four months who are facing extreme climatic swings between drought and floods. JOHANNESBURG, 10 February (IRIN) - Flooding caused by heavy rains since early January have destroyed nearly 180 square km of crops in central Mozambique. MAPUTO, Mozambique (PANA) - Torrential rains and subswquent flooding that has lashed much of Mozambique since early January have led to the loss of almost 18,300 hectares of crops, reports Friday's issue of the daily paper 'Noticias'. MAPUTO - The Mozambican government's Technical Emergency Commission was expected Thursday to send a team headed by Deputy Agriculture Minister Helder Muteia, to visit and assess the damage caused by floods in the country's central province of Sofala. MAPUTO, Mozambique (PANA) - The Mozambican government's Technical Emergency Commission (CTE) is on Thursday sending a team to visit and assess the damage caused by floods in the country's central province of Sofala. 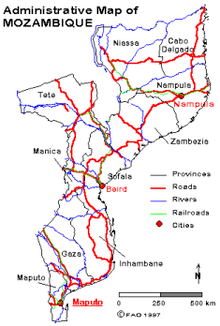 MAPUTO, Mozambique (PANA, 01/19/99) - Flooding on the Pungue and Buzi rivers in the central Mozambican province of Sofala has continued to worsen, reports Tuesday's issue of Noticias, the Maputo-published daily. The Pungue river water has covered and inundated a two to three kilometre stretch of the Beira-Zimbabwe highway, making it unadvisable for anything other than four wheel drive vehicles to attempt to cross the flooded area. The height of the river at the Pungue bridge was measured on Monday at 8.3 metres, and was still rising. JOHANNESBURG, 19 January (IRIN) - Thousands of people have been forced out of their homes due to heavy flooding in southern Mozambique, officials said on Tuesday. Angola: Humanitarian community "extremely concerned"
JOHANNESBURG, 19 November 1998 (IRIN) - The humanitarian community in Angola said on Thursday it was "extremely concerned" that intensified fighting between government troops and UNITA forces in the central highlands in recent days was making it difficult to sustain relief operations. MAPUTO, Jan 29 (Reuters) - The death toll from a landslide in central Mozambique last week could reach 143, Minister of State Administration, Alfredo Gamito, said on Thursday.